Is it time for the Vikings to trust Kyle Sloter as the backup QB? 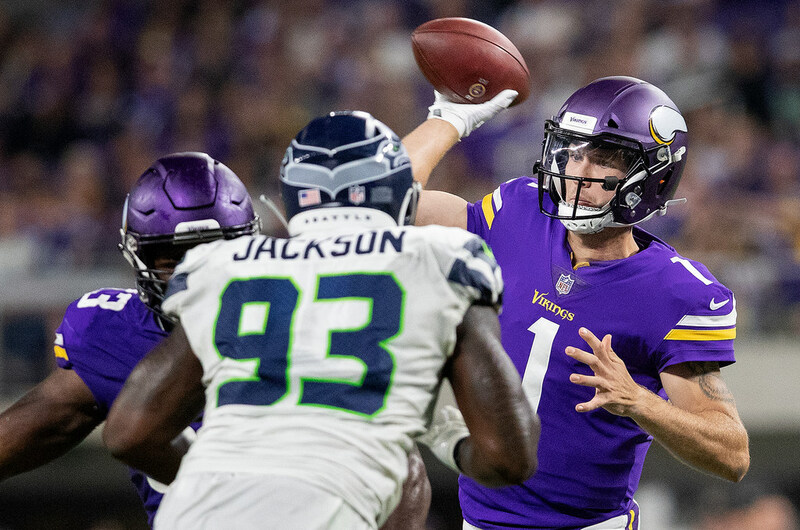 *Wednesday brought some interesting news in that former Vikings backup QB Trevor Siemian agreed to a one-year deal with the Jets. He is now the McLovin’ we lost. The question now for the Vikings is whether they trust Kyle Sloter enough to be QB2 behind Kirk Cousins, whether they will bring in another clear-cut backup or whether they will settle somewhere in-between. Sloter, you’ll recall, went undrafted in 2017 and was in camp with the Broncos before the Vikings made an aggressive bid — paying him nearly triple the going rate for practice squad players — to add him. He served primarily as the No. 3 QB each of the last two seasons, including a year ago firmly behind Cousins and Siemian. He had a strong preseason in 2018, completing 73.2 percent of his passes for 366 yards, four TDs and no interceptions. But if you’re the Vikings — with so much riding on 2019 — do you roll with Sloter? Our Andrew Krammer reported that the Vikings wanted Siemian back and are exploring other options, so it would seem at least like they had budgeted for another QB. Given how pressed up against the salary cap they are, though, maybe that’s a place to save money? Add in the fact that Cousins has started all 16 games each of the last four seasons (taking every snap last year with the Vikings) and the fact that Sloter might be ready for an increased role and maybe the Vikings go that route? Or maybe they hedge their bet and bring in another low-money QB to battle with Sloter for the backup spot? Maybe they’ll be 1-2 on the depth chart in 2019? *The Timberwolves’ announcement that Robert Covington, Jeff Teague and Derrick Rose are all expected to miss the rest of the season sure comes at an interesting time. Maybe the team was just waiting for clarity on all three, but announcing them at the same time gives the impression that the Wolves — all but eliminated from the playoff race — have shifted their focus. *Ichiro retired, ending one of the best and most interesting baseball careers in recent memory. I had a chance to talk to Ichiro and Pete Rose about the pursuit of 4,256 hits a couple years back, if you have a few minutes to spare.